In 1964, Russ Williams and his stepson Bob Munn built the first self-storage facility with garage-style doors in Odessa, Texas. Over the years, self-storage facilities have cropped up all over the nation. Currently, self-storage is a multi-billion dollar industry, bringing in $38 billion in annual revenue. Almost 10 percent of all American households rents a self-storage unit and spends an average of $91 a month on their rent. In the United States, there is 2.3 billion square feet total of rentable self-storage space in about 50,000 storage facilities. To put that number in perspective, self-storage developments outnumber both McDonald’s restaurants (over 14,000) and Starbucks locations (around 12,000) in the US. Population density — Without people, there is no demand for storage. The facility should have 50,000 people within 3 miles of the facility. Rolfe says that buying a self-storage facility in a small town probably won’t be successful enough to be profitable. Traffic count — Rolfe says that most customers find a storage facility from driving by it. The facility you purchase should have a traffic count of 25,000+ cars per day. Median household income — People who can afford to spend $100 per month (or more) on a self-storage unit usually have a discretionary spending ability. They also have excess belongings. In order to find these people, Rolfe says that the median household income should be at least $50,000. Whenever you purchase a used property, there are usually some costs required to get it into tip-top shape. 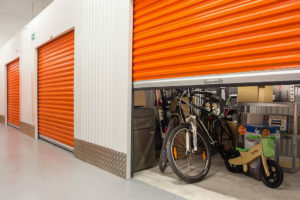 Even though most buyers budget for upgrades, a neglected self-storage facility might need more than a few quick-fixes. Broken doors, broken fences, an outdated office, or a lighting system that needs serious attention can really add to the total price of the facility and eat into your budget. When considering Texas storage facilities to purchase, look beyond the listing price to the overall condition. A decade ago, having a decent website was good enough for a business. Yet mobile technologies have drastically altered the way that business is done, including self-storage. Many customers want to search for, reserve, and pay for their unit with their mobile phone. Without reliable, user-friendly technologies in place, a self-storage facility will lose a certain number of customers. If you purchase a self-storage facility in Texas without the latest customer-facing technologies in place, learn how much you would need to spend on these technologies. As you investigate which facility to purchase, be sure to examine the local competition. Know the number of nearby facilities, how many units each has, and if there is a capacity for new storage facilities in the area. Much of Texas has a sub-tropical climate, leading to mild winters, but hot, humid summers. Heat and humidity are two things that can damage furniture, clothing, keepsakes, and other things that people place in self-storage. Since Texas summers are so hot and humid, make sure the self-storage facility has ample climate-controlled units. This assures your customers’ belongings stay in top shape while in storage during the subtropical Texas summers. To many historians, Texas is the home of modern self-storage. Throughout the Lone Star State, there are opportunities for commercial real estate investors to buy Texas storage facility. If you are considering investing in a Texas storage unit development, know what you are getting into before you buy. Choosing the right property in the right location can provide long-term profitability. Alternatively, choosing the wrong property can drain your profits. To make a wise choice when purchasing a self-storage development in Texas, follow the guidelines above.